Aurora EDC leased 2,010 SF of office space in the Aurora Park Plaza at 12510 E. Iliff Avenue Suite 115 for 5 years. Matt Kulbe of NavPoint Real Estate Group represented the landlord. This lease was executed in October. Billie J. Bemis, LMFT, LAC, CFI, SAP leased 902 SF of office space in the Aurora Park Plaza at 12510 E. Iliff Avenue Suite 100B for 3 years. Matt Kulbe of NavPoint Real Estate Group represented the landlord. This lease was executed in October. Just Results PT, LLC. leased 5,458 SF of industrial space at 3400 Industrial Lane Suite 11D for 3 years. Matt Call and Matt Kulbe of NavPoint Real Estate Group represented the landlord. This lease was executed in October. MedAware Systems, Inc. leased 4,488 SF of office space at 3400 Industrial Lane Suite 1B & 2 for 4 years. Matt Call and Matt Kulbe of NavPoint Real Estate Group represented the landlord. This lease was executed in October. Marathon Systems, Inc. leased 609 SF of industrial space at 3400 Industrial Lane Suite 2A for 2 years. Matt Call and Matt Kulbe of NavPoint Real Estate Group represented the landlord. This lease was executed in September. Sundew Technologies, LLC leased 6,814 SF of industrial space at 3400 Industrial Lane Suite 7 & 1A for 5 years. Matt Call and Matt Kulbe of NavPoint Real Estate Group represented the landlord. This lease was executed in October. Cali & Mo leased 1,316 SF of retail space at 307 Third Street for 3 years. John Witt of NavPoint Real Estate Group represented the landlord. This lease was executed in September. Podiatry Associates P.C. leased 2,450 SF of industrial space at 185 Caprice Court Unit A for 3 years. Matt Call of NavPoint Real Estate Group represented the landlord. This lease was executed in September. Michels Pipeline Construction leased 350 SF of office space in Meadows Executive Suites at 3740 Dacoro Lane Suite 200C. Matt Call of NavPoint Real Estate Group represented the landlord. This lease was executed in September. Beauty Systems Group, LLC leased 1,858 SF of retail space in The Shops at Castle Rock Village at 910 A & B North Park Street for 5 years. Heather Taylor of NavPoint Real Estate Group represented the landlord. This lease was executed in September. Crossfit Loop leased 5,066 SF of retail space at 136 Wilcox Street for 5 years. Matt Call of NavPoint Real Estate Group represented the tenant. This lease was executed in September. BD Gann, LLC leased 867 SF of office space at 3405 Downing Street Unit C for 3 years. Matt Kulbe of NavPoint Real Estate Group represented the landlord. This lease was executed in September. Randy Chiropractor LLC leased 1,770 SF of office space at 5800 East Evans Avenue Annex for 5 years. Matt Call and Matt Kulbe of NavPoint Real Estate Group represented the landlord. This lease was executed in October. Mattress Firm, Inc. leased 3,700 SF of retail space at 335 W. Hampden Avenue for 10 years. Ian Elfner of NavPoint Real Estate Group represented the landlord. This lease was executed in September. Sprint leased 1,250 SF of retail space in the Cherry Hills Marketplace Unit A8 for 5 years. Ian Elfner of NavPoint Real Estate Group represented the tenant. This lease was executed in October. LFT Fitness, LLC leased 5,233 SF of retail space in the South Broadway Car Care Center at 8081-C South Broadway for 3 years. Heather Taylor of NavPoint Real Estate Group represented the tenant. This lease was executed in September. Intervention, Inc. leased 5,242 SF of retail space in the Lashley Retail Center at 390 Lashley Street for 5 years. Matt Call of NavPoint Real Estate Group represented the landlord. This lease was executed in September. Leisuretime Laundry, Inc. leased 2,408 SF of retail space in the Lashley Retail Center at 310 Lashley Street Suite 109 for 10 years. Matt Call of NavPoint Real Estate Group represented the landlord. This lease was executed in September. Vapor Source, Inc leased 6,588 SF of retail space in Treasure Island at 1212 & 1214 S Prairie Avenue for 5 years. 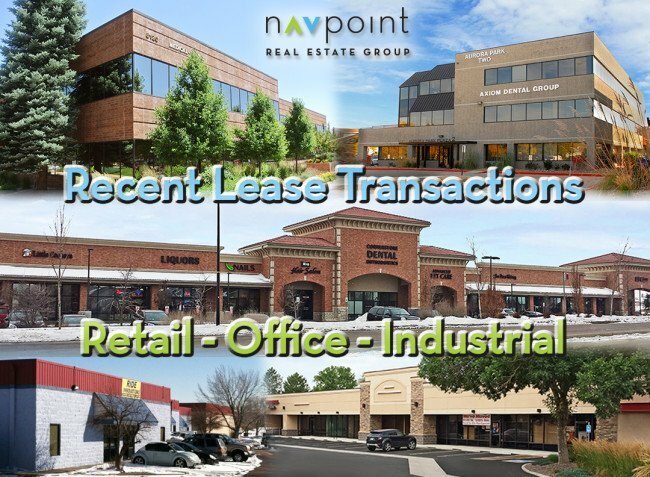 Matt Call of NavPoint Real Estate Group represented the landlord. This lease was executed in October. RCA Holdings leased 1,520 SF of industrial space at 4111 S Natches Court Unit F for 3 years. Ian Elfner of NavPoint Real Estate Group represented the tenant. This lease was executed in October. The Joint Chiropractic leased 1,340 SF of retail space in Sheridan Crossing Shopping Center at 4830 W 120th Ave for 5 years. Ian Elfner of NavPoint Real Estate Group represented the tenant. This lease was executed in September. Barre Forte leased 1,275 SF of retail space at the SWC 144th & Orchard Parkway for 6 years. Ian Elfner of NavPoint Real Estate Group represented the tenant. This lease was executed in October.